For most developers, releasing a sequel would usually mark the end of work on the original game as they move onto DLC, patching, and performing general maintenance for their new baby. 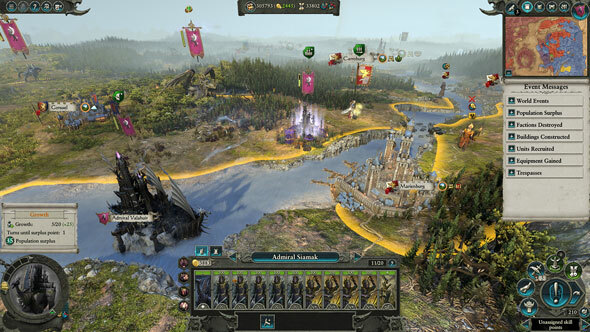 But for Total War: Warhammer developers Creative Assembly, the work never stops, as they have set themselves the task of merging the campaign maps of all three games in this eventual trilogy. As well as talking to Creative Assembly about Mortal Empires we have played it and can tell you what we think of this huge, free DLC. The first step on this uncharted path is Mortal Empires, a free DLC out this week that fuses the Old World from Total War: Warhammer with the sequel’s New World into one massive sandbox, featuring 117 factions and 35 playable Lords from both games. We spoke with game director Ian Roxburgh and lead designer Jim Whitson about the ambitious Mortal Empires DLC and the ongoing work of building the Total War: Warhammer world. During our chat, there was a lot of cheery, exasperated head-slapping about the scale of the endeavour, mainly about the difficulties of making it all play nice with Steam’s API (complicated by the fact that this Warhammer II DLC requires the player to also own the previous game), and the countless columns and rows of dry spreadsheet work to make it all come together. When it comes to actually designing Mortal Empires, however, the pair are more stoic, talking about it as just another necessary step in their quest to create the ultimate videogame tribute to the Warhammer world. From a player’s perspective, Mortal Empires almost has the hallmarks of a fan project, in the vein of how modders fuse together the worlds of Skyrim and Oblivion, or Fallout 3 and New Vegas, but for Creative Assembly the inspiration stems from Warhammer lore. Fusing two games may sound like the videogame equivalent of genetic splicing, but every army across the two games has been designed under the assumption that they may eventually meet. Even the mechanics unique to Total War II factions – such as Rites – have been meticulously designed to coexist in one big war-torn world with the Old World content. 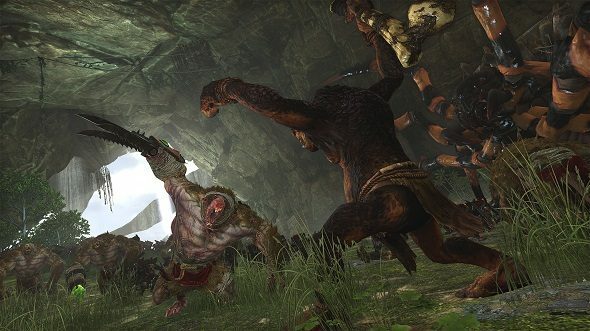 What makes Warhammer stand out from past Total War games, and align with its tabletop counterpart, is that it thrives in a degree of imbalance – in how the Skaven use the Underway and inhabit ruins to ambush physically superior enemies, or in how Vampire Counts raise the war dead to fight for them. Share too many traits among the factions and “it would just become one big generic war game,” according to Whitson. He does, however, concede that if the fans make enough noise about granting Old World factions Rites, then they will consider adding it. “We want to accommodate what people like,” he says. 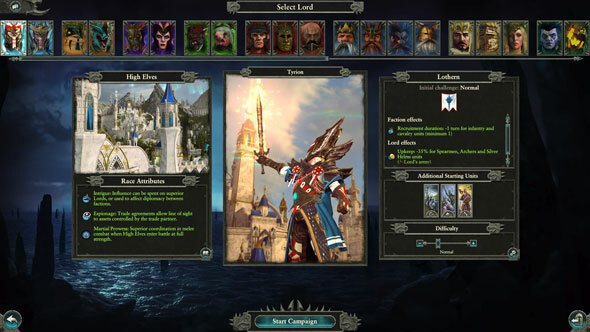 Every Old World faction making the expedition over to Mortal Empires is retaining the same abilities, units, and traits it had before, so it is tempting to see the DLC as something of a migration, where the Dwarves, Vampire Counts, Beastmen and co. are being rehoused in the comfort of Warhammer II’s polished interfaces and new campaign systems that by and large improve on the original. So has the original game, a mere couple of months after the launch of its last DLC, already been rendered obsolete? Roxburgh insists that “the Warhammer 1 campaign stands as an interesting game in its own right,” but admits that the Mortal Empires campaign has more refinements, content, polish, and UI improvements. 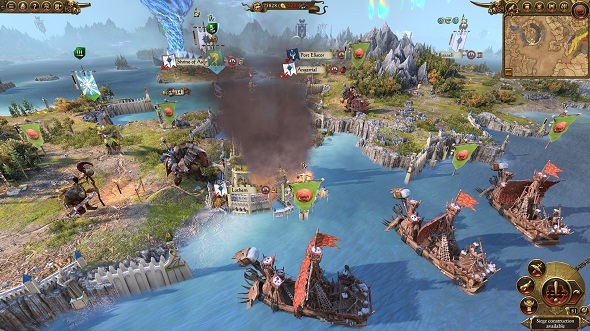 Whitson believes that making Mortal Empires has allowed Creative Assembly to confront and banish some of its design demons from previous Total War games. “Traditionally we’ve been good at short and medium-term challenges – go destroy that city, wipe out that race – but we’ve perhaps not been so good at the long-term goals,” Whitson admits. There is no strict order in which you need to complete the campaign victory conditions in Mortal Empires, but they are designed to make you focus on the shorter-term goals first, before moving onto the bigger picture. “The new long-term victory conditions [owning ‘x’ number of settlements from a list] won’t be relevant to you when you start a campaign,” Whitson continues. “Only as you tick off those shorter-term victory conditions, then you’ll start thinking ‘I need to go to Ulthuan, I need to go to Lustria’. We haven’t done that before, and it’s fun to have these different goals in different timeframes, trying to keep each plate spinning”. Words like ‘Trilogy’ and ‘DLC’ are readily thrown around with this series (understandable, given that there are three games, and a lot of DLC), but they do not quite encapsulate it, fragmenting what is in fact a seamless development process. As a whole, Total War: Warhammer is a gestalt of expanding mechanics, maps, interfaces, and systems that is only at its halfway stage of evolution. 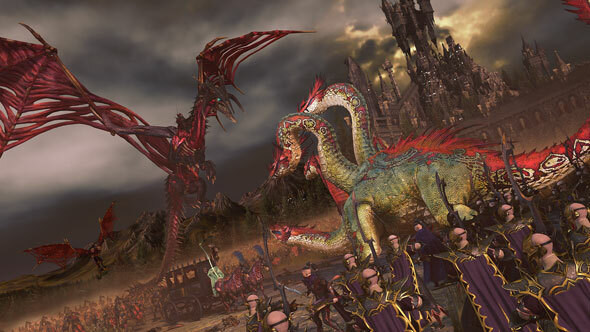 So spare a thought for Creative Assembly, because even though Mortal Empires has just inflated the Total War: Warhammer world to unprecedented proportions, their work on the series goes ever on.